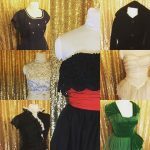 A traveling and online pop-up vintage superstore based in Milwaukee, Wisconsin boltedvintage.etsy.com. You can always find Michelle at Vintage Garage Chicago all summer and we are thrilled to have her and her all authentic vintage clothes at the show! If you search her racks, you won't find anything newer than the 1970's and she's a purist. Authentic vintage is her game. Vintage fabrics are also a favorite. Every month is a new adventure with all the wares your little heart desires. 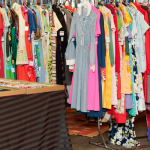 Specializing in women's clothing and printed fabric yardage from the 1950s - 1970s, this is a don't miss booth.